A Government minister has expressed concern about the potential risks to lives and jobs arising from forest fires, like those last week in Wexford, Kerry, Clare and Galway. Minister of State with responsibility for Forestry Sean Connick said hundreds of hectares of woodland nationally have been lost and it has taken a lot of time and effort to bring the fires under control. Mr Connick thanked people who had helped to control the forest fires and he reminded all landowners that it is illegal to burn growing vegetation between 1 March and 31 August. Mr Connick said he had visited fire-damaged forests in the vicinity of the Blackstairs Mountains. The Minister said there are a number of steps that could be taken to minimise the risk of forest fires. 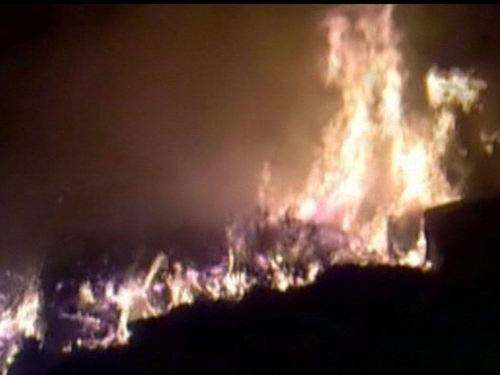 He said fires should not be lit in or near woodland, fire breaks surrounding plantations should be inspected annually prior to the fire season, owners should insure their crops, and fire plans for plantations should include a map showing access and assembly points for fire-fighting personnel, equipment and potential sources of water. Mr Connick said cooperation between neighbouring landowners is vital to successful fire prevention and he said forest owners should be particularly vigilant following prolonged dry spells. He also said if a plantation is destroyed or damaged by fire, the incident should be reported to the nearest garda station and to the Forest Service. Tonight, there were reports of fire on the Sugar Loaf mountain in Co Wicklow.